My Valentine is usually my dog (who gives great cuddles and makes me laugh so very happy with that), but I love making soppy romantic felts knowing people give them to their loved ones. I usually make a card, and we often go out to dinner, but other than that … not much. This year maybe I’ll use this paper pack – lots of pretty pink for valentines. Valentines Day is all about LOVE!! My partner & I share bubbles and food to celebrate this special day. Here is one of several items we make expressing such love. Valentine’s Day is all about Love! Hand knitted pillow is the perfect gift for your loved one on Valentine’s Day. I usually celebrate Valentine’s Day by baking something Sweet for my Loved ones…usually special cupcakes!! Valentines Day is about love hearts so heart-shaped chocolates, especially foil wrapped ones, seem to be a welcome gift. I usually give little gifts or treats to our (adult) children. Just to let them know they still hold a special place in their mom’s heart. 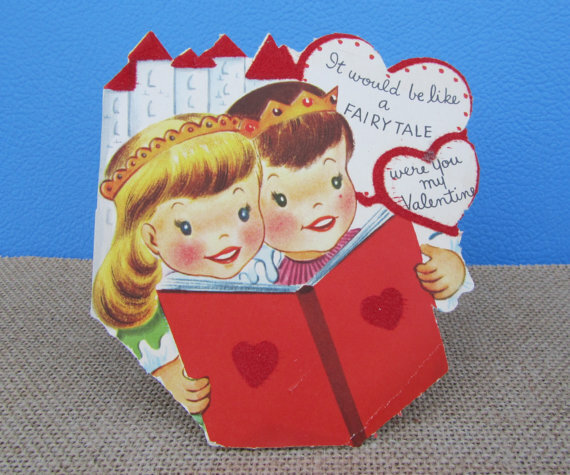 My daughter (and Shop partner) searches out vintage Valentine cards when we go antiquing. It’s fun to read the messages and see the “old-fashioned” names. Sometimes we are able to determine the time frame of the card, if last names were signed. Valentine’s Day has always symbolized love, whether single or in a relationship. We are all connected to each other and have love in our lives. For me, I have been lucky enough to be on the receiving end of the traditional flowers and chocolates and have given my family cards over the years. I especially love the little cards given in school. It’s such a simple way to show you care. It’s also a way to start the tradition for kids to express love to others. These forever flowers contain long stem red and white roses. These silk flowers will outlast Valentine’s week and are simply beautiful. To me, February 14th is not just a romantic love day. It’s about showing the love to moms, dads, brothers, sisters, new and old friends, and yes, boyfriends, girlfriends, husbands and wives. Valentine’s Day is all about love, hearts, hugs and kisses. This lovely linen-textured card encompasses all of that. Sometimes I am doing the gifts with their own hands, but sometimes I buy. After her husband’s death, it’s sad holiday. We LOVE Valentine’s Day and have more listings in our shop specifically for this holiday than any other! We have a number of picture frame designs and created a special Valentine’s Day design sheet for our glassware and other products. Have your order gift wrapped and shipped to meet your schedule @DesignstheLimit We love making gift giving personal all year round, but Valentine’s Day is your opportunity to plan the perfect personal gift giving moment, JUST ADD WINE! Children deserve little Valentine’s Day gifts too–how about a sweet doll quilt for your favorite little girl? I make; my fiance and I always have a lovely meal with something special for dessert (as I love to bake!) and a couple of quiet drinks after we’ve got our daughter to bed. Thanks to everyone for their SWEET contributions! Happy Valentine’s Day to ALL!